Rover's drill collected samples from Gale Crater on Mars. A space-age jack of all trades, NASA's Curiosity rover recorded a first by using its drill to collect a sample from a Martian rock. The rover sent images of the hole in sedimentary bedrock to Earth on Saturday, NASA said in a statement. NASA said the rover will analyze the rock powder sample. The flat rock is believed to hold evidence of wet environments that disappeared long ago, officials said. Curiosity used a drill attached to the end of its robotic arm. It's the first time any robot has drilled such a sample on the Red Planet. In its first two months on Mars, Curiosity stumbled upon an area where it appears that water once flowed in a vigorous stream. Scientists said the rover spotted rock outcrops that seem to have formed in the presence of water, with rounded gravels that may have been transported by water. We must move on from fossil fuels and concentrate on other means of space propulsion like those who already know. Exploration and profound new discoveries meet ancient knowlegde and science. Just what the comments sattle for, an agreement or disagreement and even a challenge to previous discoveries. My take is the light that shows the dream and the dream that inspires the mind. A lot still can be discovered, and the technology we see now! its just a portion of what is yet to come, so I'd be worried about what is on my dinner plate tonight and hope that I later when I dream, I travel like a star in the galaxy and take a sight of the earth from space. That wont cost a shekel of coin nor a sacrifice to archive hence it comes to men not by chance or self-will but because of creation which led to CURIOSITY going to MARS to probe what is known but yet to be proved. Oh! and HE said to me, do not make for me anymore BOOKS, the rich will fall. so this all ant in vane give the rover a new name marvin the marshin,.pnm,. that wont do cant put the jews on that plant.,.pnm,. I think it may have been an oversight that NASA drilled a hole instead of taking a core sample. (Reason: There may have been evidence that the drill "tore up" that a "core sample" would have preserved ...assuming that particular spot may have held the remains of something which may have lived there eons ago. Altogether, I am always awestruck to see the surface of an alien planet in every-increasing detail as cameras get better and better, and science does likewise. I believe that the money is well-spent and justified in its spending. After all, Curiousity is doing the work of several Astronauts. Therewith, there are no astronauts on Mars risking their lives, (freezing by night, cooking by day), etc. I ponder if the works of Nicola Tesla could be employed on Mars to simulate a magnetic field? (There is a saying that if it can be conceived, then it has already been done, or can be done). Given that Mars would need a molten core to create a magnetic field that would eventually encompass 'it' in whole ...heating the core of a planet is not beyond our technology to do, and the sun would supply all the needed energy to invoke (heat up and melt rock) a molten core, which must still exist but has cooled too much, due to planetary mass, to retain the cores required heat. Or, what could have happened (cataclysmicly), to have caused a loss (into space you say?) of liquids (water?). There is little evidence of water ever having been present. There's a lot of CO2 though, and at "ancient temperatures" it could have easily "flowed like water" (at not-so-extreme temperatures). It seems the drilling would reveal more trapped CO2 'traces' if Curiousity does indeed sit in an ancient river bed. And, will you Bible thumpers just shut up? Your rants have nothing in the least to do with the topic of this article. You are an irritant at best when you present yourselves in such ways. Now run along and rant about that, and beat up your wife and children, due to getting "chewed out" from half-way a world away. Thanks NASA! We'll be there (Mars) before we know it. In spirit if nothing else. Now, why not Venus? (It spins backwards but still has a magnetic field and temperatures just as forbidding as Mars has (leaning to the hotter end of the temperature gauge). Cheers. I think we will discover that whatever caused the planet, which is now the asteroid belt, to be reduced to a circle of rocks may well have wiped out Mars along with it, eons ago, and that with enough exploration we'll find it was something that makes nukes look mild. (The asteroid belt may well have been the outer-crust of Mars, blown off (sort of). waw..it looks very similar to earth rocks! Doesn't that EXCITE you ? It should !!!! We should be solving the world's problems rather than wasting billions on planetary conjugal visits. Well, this funding isn't coming from taxpayers my friend. The distribution of resources allocated to NASA's Jet Propulsion Labs is sourced from corporate investment. Let me know if you have any questions or concerns I can answer. It bothers me to see people disrespecting the work we at NASA try to do. JPL and NASA are working hard for the scientific community but even more for humanity. Thank's for the all well done job. You'll see that the electronic gadgets you cherish, the medical equipment you rely on and the materials that make your life cushy...were first dreamed up and created to help NASA meet its goals of space exploration. You owe your modern electronic driven lifestyle to NASA. Kudo's to Curiosity! We need more space exploration to spike up the economy. Truthfully speaking or honestly lying? Shakespeare is a white man who calls himself thou. The Bible is the black man's historical good book for the children of Israel the twelve tribes, it will be like the days of Noah. *Genesis 6:8 But Noah found grace in the eyes of the Lord. *Exodus 33:16 For wherein shall it be known here that I and thy people have found grace in thy sight? is it not in that thou goest with us? so shall we be separated, I and thy people, from all the people that are upon the face of the earth. *Hebrews 9:14 What shall we say then? Is there unrighteousness with God? God forbid. "Follow your nose, wherever it goes" Tucan Sam 14:44. Read the Christians be nice article, elsewhere on CNN. Then look in the comment section. You & your kind are no better than the Taliban. Actually, the Taliban ARE better, 'cause they don't knock on my door looking for a handout of one kind or another. So if water once flowed and there was a likelihood of life on Mars, could we help it re-populate? Or is whatever caused it to dry up now irreversible such as an unfavorable time period? In other words, could it again hold life? Pretty bad radiation from what I've heard. Is that what happen... did it lose it's ozone layer and the radiation killed everything? So how do you make an ozone layer? Fascinating stuff! The reason Mars died is that she lost her molten core. Mars is smaller than earth thus the core volume to surface area ratio is much greater which means it cooled much faster. Once she lost this, then she lost her magnectic field strong enough to divert the solar winds and protect her atmosphere. And without vulcanism, and techtonics, the replenishment of the atmosphere also stopped. When the atmospheric pressure decreased evaporation increased and eventually all surface water disappeared and was lost to space. We could artifically recover the atmosphere and also using ice asteroids replenish the water, but without creating a strong magnetic field it would be a constant battle to protect living things against the radiation and atmspheric loss. You're a sick and deluded individual-you might as well be praying to Santa. Where are the monitors when you need them. Sure, but was it dry & arid? Did your probe have to drill him out? How did the earth get it's name? *Genesis 1:10 And God called the dry land earth: *Hebrews 11:29 By faith they passed through the Red sea as by dry land: *Exodus 14:21 And Moses stretched out his hand over the sea; and the Lord caused the sea to go back by a strong east wind all that night, and made the sea dry land, and the waters were divided. *Isaiah 48:20 say ye, The Lord hath redeemed his servant Jacob. F'n r.e....tard. Jesus is too. Amen. Since Roman census records do not show that name, in the time, in those places......... Couldn't have been made up now? Ancient lake bed on the mohave desert. Nice shot. Don't you wanna get your lake bed drilled & probed? How amazing and incredible! I only wish I could walk around on the martian surface. Being that I cannot do that, this is then next best thing and it's just super! I hope this helps to expand people's minds and earth-centric views on religion on humanity. This could be the end of the mystery of where Jimmy Hoffa is, or it could be a total waste of money. Exodus 13:15 therefore I sacrifice to the Lord all that openeth the matrix being males; but all the firstborn I redeem. *Acts 17:23 For as I passed by, and beheld your devotions, I found an alter with this inscription, TO THE UNKNOWN GOD, Whom therefore ye ingnorantly worship, him declare I unto to you. *Revelation 13:8 And all that dwell upon the earth shall worship him, whose names are not written in the book of life of the Lamb slain from the foundation of the world. Oh baby... you are WEIRD. Um are you OK? I would hate to meet your family. They must be brainwashed just like you. Sad. By the way maybe your reply has to do with Mars being invaded by mankind? Maybe you feel that we should stick to earth stuff only? Maybe finding stuff on another planet might help prove that what mankind has been told by history books is WRONG! Can that thing goes a little faster? I mean, is not like the traffic is too heavy. Patience... This is a two Earth year (1 Martian year) mission, and could very well go far beyond that if all the MSL's systems remain a-okay. 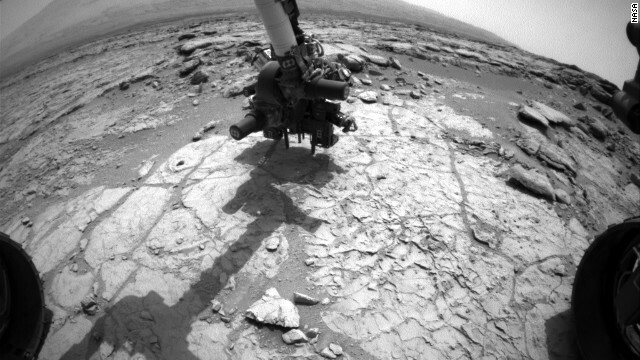 Curiosity is a *very* expensive piece of hardware they cannot repair it if a part breaks. Consequently, the engineers and scientists are extremely cautious and methodical when operating it. Also keep in mind that the scientific teams behind each experiment on Curiosity want as much time as possible to use their particular 'baby', so time has to be parceled out carefully. Haha, nice! But, if I remember correctly, it takes roughly 15 minutes for the Rover's transmissions to reach Earth which means the scientists here at home aren't getting the images "real-time". They basically have to create a map with the delayed images and navigate from there. Hurrying along would not bode will for the Rover or the mission. Did anyone notice how quick mars turned into political rhetoric? And for the Bible guy, there is not one place in the Bible that talks about squirrels but i see them every day. There is also no mention of North or South America either Maybe god didn't see all that other stuff that he made on the other side of the planet.. Does anyone not notice the absence of snow in the bible? Also, no mention of bacteria and viruses, which, one would think, would be quite an important message for humanity. No mention of marsupials, or penguins, and no mention of.... well anything that people in the middle east, at the time, would not have known about. One could almost conclude that perhaps, just perhaps, the book is a product of less than divine sources. I wonder how Noah dealt with vultures? What did he feed them? Maybe all the dead animals that he didn't need to carry? And what about carnivores? How did he keep the lions separated from the antelopes? and... and... oh gosh, so many questions, so few answers. A koala bear, if it were to basically run all day, can travel maybe ~20 miles. It only eats eucalyptus leaves. Eucalyptus leaves on grow in Australia. Even if there were a land bridge for it to have crossed, it would have needed to travel 8000 miles to get to the Ark and then it would have needed to travel 8000 miles back. which would have taken 800 days plus 30 days (and nights) away from its food source. Now I believe in God and I believe that created by a superior being is as logically tenable of a position on the origin of the universe as any other, but there is no way the creation account in The Bible is literal, and the sooner we believers get over that the better we are going to be able to effectively serve the rest of humanity. Noah went to Antarctica via a huge fish. Then brought back the penguins in the belly of the fish and the fish spit them off onto the shore. Noah had to wash the penguins off all the while the little buggers were pecking at him. Noah lost his index finger over the whole thing. He also had what we call PTSD from riding in the fishes belly with the penguins pecking at him the whole time. True...no mention of squrrels but lots of them around...and not one place in any holy book that specifically mentions NUTS either... But...there were lots of them in the bible too...and plenty of em today for sure! – Oh...and GO CURIOSITY!!!!!!! Let's cut propaganda from human space colonization and adhere to the scientific method! Would a golf ball ever land back on our Moon; And if so, how big should the 18 hole course be? Common! Are you saying that you don't understand the importance of the word "had" in that sentence? For those of you who don't appreciate the importance of this please look up the "Dunning-Kruger Effect". LOL–I believe exploring the universe is important but was curious about what you were talking about, and now I can't help but feel like you pulled one over on me. Even if you one of those who feel the money for this project was not well spent you have to admit that from a technological and scientific standpoint it's incredibly amazing. The money will be well spent when I can play golf there. Golf should be more interesting on Mars when compared to our Moon since Mars has atmosphere, hence aerodynamics which enables the golfball to come back down; Do you agree? You don't have a clue about basic scientific principles or about the details of the Martian atmosphere. Gravity is what makes stuff come down. Air resistance can slow a moving object, e.g. your golf ball. Unless the ball is hit fast enough to escape the gravitational pull of the Moon or Mars as the case may be it will come down. How fast it goes initially depends on its mass and how much energy it is given by its impact with the golf club. Scientific illiteracy prevails in America today. Amazing the negative comments that appear on a great story. I think it is great that we are exploring the universe. You and who else? There is green cheese there, we just will not send the mice. Do not be a tourist. November 27, 2006 – Johnson Space Center – Nasa http://www.jsc.nasa.gov/.../GuyWW_11-27-06. ... File Format: PDF/Adobe Acrobat – Quick View Nov 27, 2006 – for the tourist part, because they were having no tourists. There weren't any tourists in . I hope they called 811. Know before you dig. Oh, excellent, LOL. Hitting a Martian sewer pipe would sure make for some interesting science, though! Are they going to frack it? Lets shut down NASA and give the money to the Great Society, after all they have contributed so much since Lyndon Johnson put them all on unlimited welfare and benefits. Did your knee hurt when it jerked like that? Why don't we just shut down all programs and give the money to the illegal immigrants and the minorities. Hey Balls of Cr@p. Hope you are having a good day. Keep spreading the word! Please... because it's this rhetoric which cost you the election, and will continue to to cost you every election after this until some day – hopefully – we actually get a valid second political party back and not one hoodwinked by a bunch of reactionary racial morons who actually think there was something to the Tea Party other than a means of bypassing the EPA in order to lay a pipeline. If you really believe in free enterprise, then let's begin by stopping all corporate welfare. If a company has the guts to actually "create" something, let them spend their own money for research and development. Without NASA you would not have the computer you are now typing with. If you want to feed that hungary child then get your legislators to stop the give away programs in the form of Foreign Aid to every country in the world but two. Why are we supporting the world with borrowed money? Even if we hadn't sent a rover to Mars, believe me...the child you're talking about still wouldn't have gotten a dime of that money. people having kids that are stupid and can't take care of them doesn't need any assistance from anyone...stop having baby's if you cant afford them. Stop posting here if you can't spell. Robotic planetary exploration and birth control do not seem to be directly related topics to me. Get real; Another Hollywood landing while my friends and I await a falling golfball; is it falling? No air; what will make it fall? Is that golfball just circling? they did this drilling without an enviornmental impact report first. Not to worry. If there is any kind of life there we will damage it irreversibly. Geez, can't we just enjoy robots on Mars for five seconds? Why is that not amazing? Can you drill a hole on Mars? Me neither. But I love that we get to see it. Smile people. It's not that bad down here. We were drilling for heavy metals on Mercury when, as a child I watched a golfball hit on the Moon on TV. Did it ever land without air to slow it down? Yes, it's called gravity moron. Gravity is what makes you ball come to the ground not atmospheric drag. Get an education. This is what happens when your politically-selected (elected?) school district chooses to teach creationism over science – you don't have a clue about how the physical world actually works. Using your understanding, you could be put in a vacuum chamber here on Earth, get you to hit a golf ball, and it would never come back down. But of course, you never got any education in the sciences, so how could you know better? It's one thing if you believe in conspiracy theories (like the Moon landing being a hoax), but at least think through the stupid statements you continue to make. Use a search engine on your computer and learn about gravity, air resistance, mass and weight, velocity, momentum. Obviously, God created Mars to be a pleasant red dot in the sky for humans. He would have no reason to put water there, so there has never been any water on Mars. Uranus, Neptune, and Pluto don't exist because they're not mentioned in the Bible. The Bible is merely a selective collection of old writings. Try the faith given to mankind without studying or listening to BS revelations by BSers. Pagan...the true faith of the HUMAN. You will be enlightened and enjoy a much more relaxed life. Amen to that. I love science for it truely is universal. Look at that...it's a fishing hook! And there's some old monofilament still attached. If they hit oil Exxon Mobile will have a rig up and running in ten years. The pipeline however will take a bit longer. You're right, I didn't think of that, NASA is destroying some of the last pristine wilderness on Mars. We should have a ban on the use of skycranes to land any kind of payload on Mars. That would effectively prevent any future attempts at Mars exploration while appearing to be just a commonsense precaution. Wow! This is just so worth it. Unfortunately we are better at exploring dead planets than we are at keeping this fabulous planet alive.